What's New | Liberating Technologies, Inc.
Liberating Technologies has collaborated with Coapt Engineering to create a new pattern recognition controller for the Boston Digital Arm System. This new plug-compatible control module replaces the standard input connector circuit board and dedicated electrodes on a Boston Arm. When combined with an eight channel electrode array, electrode amplifiers and training button, the elbow becomes a pattern recognition controlled system. The user can train the system to recognize unique EMG patterns for controlling elbow, hand and wrist movements. As a result, there is no need for time-consuming EMG site selection and the user does not need to co-contract their muscles to switch control from one device to another. Since the EMG patterns are unique, the prosthesis responds to each of these commands independently. LTI specializes in integrating the Coapt controller with other products like the Boston Digital Arm System for trans-humeral patients. For more information about these new and innovative prosthetic technologies, contact LTI at 800-437-0024. The new small (7¼”) Bebionic hand (on left) has been released! This new multi-articulating prosthetic hand builds on the previous Bebionic V3 design and yet has several enhancements that differentiate it from its predecessors. It has the improvements that were incorporated into the larger V3 hands to increase strength and durability, including; an aluminum chassis at the MCP joints, redesigned mechanical finger fuses and a more robust thumb base. It also has soft removable finger palps, silicone-bronze link bearings, twin finger links for increased strength and lateral stiffness and a more natural line from the hand to the wrist. Most important however, is the size – this new hand fills the need for a prosthetic hand for smaller males and females. It measures 7¼” in circumference, less than 3” wide and weighs under a pound (440 grams)! 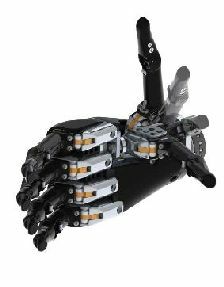 This new hand has the same grasp options as the larger Bebionic hands and uses the bebalance™ software. It is available with two wrist options; EQD and short wrist. It also comes in two colors; black and white. LTI specializes in integrating the Bebionic hand with other products like the Boston Digital Arm System for trans-humeral patients. For more information about these new and innovative prosthetic devices, contact LTI at 800-437-0024. The newest iLimb hand, the Ultra-Revolution, has been announced. This builds on the iLimb Ultra Hand design, but the Revolution provides another unique feature – a powered rotating thumb. The thumb automatically shifts from lateral to opposition grasp, thus eliminating the need for the user to involve their sound-side hand. This hand still has the varigrip and the auto-grasp features and since each finger has individual stall current detection, the hand conforms to the shape of the object that it is grasping. Revolution and Ultra hands are available with three wrist options; a QD wrist, Flex-wrist or Multi-flex wrist. The Biosim™ mobile control application is also unique. This enables the user to access 24 grasp patterns through a mobile device app. The Touch Care™ system is also available. This provides extended warranty coverage and support, an iPod/Touch with the Biosim app and replacement iLimb Active Skins as well as a courtesy hand if required during servicing. LTI specializes in integrating the iLimb hands with other products like the Boston Digital Arm System for trans-humeral patients. For more information about these new and innovative prosthetic devices, contact LTI at 800-437-0024. An upper-limb prosthesis using Targeted Muscle Reinnervation was demonstrated by Dr. Todd Kuiken at the recent American Association for the Advancement of Science (AAAS) meeting. This prosthesis featured a new pattern recognition system with the LTI Boston Digital Arm. This innovative technology provides greater dexterity and better control than traditional prostheses. It uses input signals from reinnervated muscles and interprets the pattern of these signals to determine the user's desired movement. Liberating Technologies introduces the new Partial M-Fingers to augment the full M-fingers for partial hand kit. This kit consists of dexterous fingers, a multi-position friction thumb and mounting plates for use in a mechanical hand assembly. The fingers and thumb have urethane over-molds to provide better grasp and molded-in finger nails for picking up small objects. The fingers are actuated by a Spectra cable that crosses the wrist and is controlled by simple wrist flexion. Each finger independently conforms to the shape of the object it is grasping, thus allowing for multiple grasp patterns. M-Fingers are available in a variety of lengths and colors and can be customized to meet the specific needs of the patient. M-Fingers are normally built onto a silicone partial hand socket with the appropriate number of fingers and finger sizes to match the sound-side hand. This fabrication can be done by the local practitioner or through one of several qualified central fabrication facilities. The new LTI Locking Shoulder Joint was the winner of this years Gold Engineering Award from Product Design and Development Magazine. It has been redesigned to provide more strength and greater resistance to wear. Made from high strength aerospace alloys, the joint is a durable and yet light-weight (143 grams). The shoulder swings in a natural arc during gait, but it can be locked in 36 positions, or every 10°. The joint can be left in either the free-swing or locked mode. The user can free the joint manually or by using an optional nudge control. A powered unlock option (shown in photo) was announced in 2009. Abduction/adduction is achieved through a second hinge with adjustable friction. The LTI Locking Shoulder Joint can be used in both endo- and exo-skeletal prosthetic systems.